Edward Abbott was reared in a Christian home and saved at the age of ten. He was called to full-time service as a teenager. He received his B.S. degree at John Brown University. While earning his graduate degree at Faith Theological Seminary, he married Flossie Hamilton, who also was reared in a Christian home. She was saved at age 5. Their only United States pastorate was in New Jersey from 1963 to 1967. On Sept 12, 1967, God made clear His calling to the Abbotts for service in Mexico. They arrived on the field in May of 1968, with their four children. Following a year of language study and acquaintance with the field, culture and work, they began their primary ministry, a Bible Institute for village youth. Village evangelism, children’s classes and church planting also occupied much of their time. Over the years Edward has written and developed the entire Institute course; trained graduates to teach in the Bible institute. He has also written, prepared and distributed thousands of Bible teaching lessons and booklets for Sunday Schools and Vacation Bible Schools. He has also taught Bible doctrine and other Bible courses on video. The courses are used in video Bible institutes in sixteen countries with outstanding success. The Abbotts now have eight children. Seven of them have married Mexican Christians. Six of them and their partners, most graduates of the Bible institute, are now serving the Lord fulltime in Mexico. The Abbotts now have 21 grandchildren, all of them Mexican citizens. In 1999 Edward resigned as director of the Institute which he founded. His son, Timothy became the director for four years. In June, 2003, upon his resignation, Andres Franco, one of the Abbott’s son-in-law accepted the position of director of the Institute. He has served in the Institute ministry since 1989. In recent years Edward continues his writing and recording ministries in Spanish. He has taught in the Institute, as well as preaching and teaching in conferences and evangelistic campaigns. 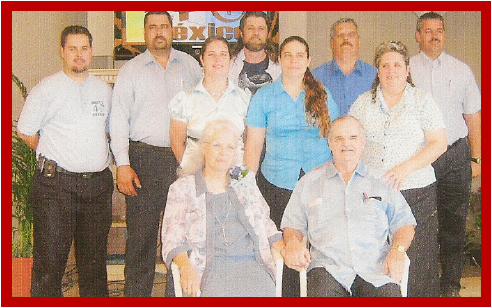 The Abbotts began their Bible Institute ministry in 1969 for poor village and other lower class Christian youths. All of the present teachers in the Institute are graduates of the same. Graduates are now pastoring, founding churches and working with other pastors and missionaries in many parts of Mexico. More than forty are pastors. and board, or tuition. The Institute is supported by offerings of interested Christians and churches. Mexican churches are learning to send offerings to the Institute, but over ninety-five percent of the support still comes from the U.S.
Eben-ezer Institute has a building that houses offices and three classrooms, dormitory space for about twenty men and a storage building. The Abbott’s former home serves as school kitchen, dining room and dormitory space for about eight girls. Andres’ family now stays there during the school year. Enrollment in recent years has run as high as fifteen young men and five girls. Students attend classes Monday through Friday mornings with a few classes in the afternoons. Most afternoons are dedicated to manual labors. Evenings serve for study hours and church services. On weekends all students are out in practical Christian service in churches and missions, personal evangelism and visitation. The Institution program first stresses preparation of the spiritual life of the students, then solid Bible instructions, doctrinal foundations and practical “how-to” courses to help equip them for Christian service. The weekly practice of preaching and directing Bible classes help students develop tools with which to give God’s Word to their own Mexican people. Gloria, Joseph and I had the privilege of being at the Institute some years ago. I had the opportunity of preaching to the people and it is a memory that still warms our hearts. Every American Christian should take time to visit a mission field. There is much to learn from people from other countries. Bro. Abbott has had some physical challenges this year and would appreciate your prayers for his health and their ministry. The Abbotts have served the Lord faithfully all of these years and desires to serve as long as the Lord leaves them here. You may write them at P.O. Box 2023, Harlingen, Texas, 78551. « Everything I need to know about life, I learned from Noah’s Ark. » PROOF READING, A DYING ART!